According to the Swiss newspaper Le Matin, from now on it is forbidden to cover your face in a public space in the Italian-speaking Swiss canton of Ticino. Following a successful popular vote to ban face covering in public in the canton in September 2013, the Canton’s government has now approved changes to the law to bring the ban into force. 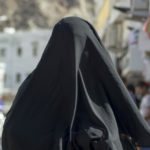 According to the Government this law was to be applied in the same way, to muslims who wear the burqa or niqab, and sports fans and protestors who cover their face or wear helmets, however in the end they produced a law specifically targeting the wearing of veils. This ad hoc law contains nine parts, some of which promote integration and social exchange. Ticino’s grand council is believed to have been specific to avoid mixing the issues of gender equality, hooliganism and masked protest. Fines for breaking the new law range from CHF 100 to CHF 10,000, and no exception has been made for tourists. Warnings that it is forbidden to cover faces in Ticino, will be placed at Swiss airports and customs borders to warn those visiting Switzerland. Around 40,000 middle eastern visitors visited Ticino in 2014 according to canton sources, a rising trend. These visitors are important for hotels and retailers suffering from declines in European visitors due to the strong franc. This new Ticino law is similar to the 2010 law banning full veils in France, that the European court of human rights validated in July 2014. While against Ticino’s move, the Swiss federal government considers that the new law does not violate federal Swiss law. Good for the Ticinese! Walking around the centre of Geneva this summer was like being in Saudi Arabia or Iran! It was frightening really, because one doesn’t know who is behind the face cover, man, woman, terrorist? I wrote to Pierre Maudet about this, but he doesn’t want to ban face cover.